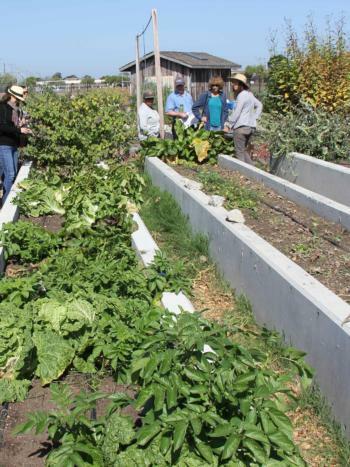 In 2009 the Treasure Island Job Corps Center established a 1-acre farm. Today, students from the construction program continue to build farm infrastructure while culinary students prepare heirloom and specialty vegetables for the school’s catering business and cafeteria. Corey Block, who manages the farm, teaches students about unique vegetable varieties such as purple cauliflower and French market carrots. With the growing farm-to-table movement, the farm has became a critical teaching tool that trains students to work with the fresh, seasonal produce preferred by most high-end restaurants. The farm has 80 fruit trees, vegetables, herbs, bees, and laying hens. On average students will harvest and use 200-600 lbs of produce a month. Treasure Island was created from fill dredged from the Bay. The EPA found many toxic chemicals in the soil. With the help of a one-time $180,000 grant, the farm was able to rise above many of these challenges. The soil at the farm was tested at length and raised beds and substantial amounts of soil amendments were used to create safe growing conditions.